Since being drafted by the then St. Louis Rams with the first overall pick in the 2010 NFL Draft, Sam Bradford's career has been a whirlwind. Suffering two ACL injuries, one that sidelined him for an entire season in 2014. At the time it was clearly evident that the marriage between Bradford and the Rams needed closure. Shipping him to the Eagles, this was a chance for Bradford to thrive. With a fresh start, a head coach who experienced some early success in Chip Kelly, and an offensive coordinator that he had familiarity with in his career in Pat Shurmur. His tenure with the Eagles did not last long as the team finished with a 7-9 record and Kelly was ultimately fired soon thereafter. Turning over a new leaf, the franchise hired an Andy Reid disciple in Doug Pederson. Not only did the franchise do that, but they made an interesting move, trading their 2016 first-round, third-round, and fourth-round selections, along with their 2017 first-round and 2018 second-round selections to the Cleveland Browns for their 2016 first-round, and a conditional 2017 fourth-round pick. The trade put them in prime position at No. 2 overall of the 2016 draft to select QB Carson Wentz. With the selection of Wentz, the writing seemed to be on the wall for Bradford as he and his agent Tom Condon requested a trade. The team honored their request, but it still seemed to be somewhat of an unexpected move. 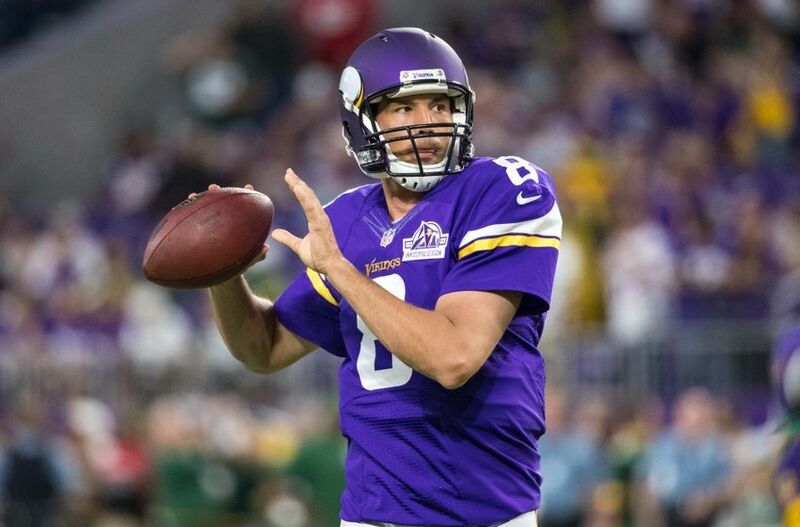 It was a trade that sent shock waves throughout the entire NFL, as the Minnesota Vikings sent their 2017 first-round and 2018 fourth-round selections in exchange for Bradford. The move came just days after QB Teddy Bridgewater suffered what was called "a significant knee injury". General manager Rick Spielman had plenty to say about the entire situation. "The one thing that I will not do, and I promise you this, is put our organization in a situation where it's going to inhibit us or hurt us going into the future," Spielman told reporters Thursday. "By that, I mean people are asking for some crazy things. People think that you are desperate, and we are not going to do something that in my estimation, and talking with Coach Zim (Mike Zimmer) and our ownership, that puts us in a situation where we jeopardize the future of this franchise." An interesting situation all-around, but it was yet another chance for Bradford to prove his worth with another fresh start in a new situation. This situation seemed different than his previous two stops though. With the Rams, he didn't have an ideal supporting cast of players surrounding him, nor in head coach Jeff Fisher, who has proved to be the model of mediocrity. With the Eagles, he had a receiving corps that was near the top of the league in dropped passes. In this new situation with the Vikings, he had what was believed to be adequate surroundings. That proved to not be the case. Despite the team getting off to a red hot 5-0 start, injuries ultimately derailed their season, as they finished a disappointing 8-8. Despite going 3-8 after their bye week in Week 6, Bradford shined. Having one of his better seasons, he enters the final year of a two-year, $36 million extension he signed with the Eagles in 2015. Being in the middle of a contract year, what must Bradford do to show the organization and fan base that he should be the teams long-term answer under center going forward? It's a word that can be vague and simple at the same time, but it is one that Bradford will be measured upon the most in 2017. Quarterback wins can be somewhat of an overrated stat for some due to various ways some can win or lose games. Entering his eighth season, Bradford has registered a 32-45-1 record, and has yet to record a winning season as a starter. Yes, he has been in arguably bad situations with his previous two teams, but now it is time. Spielman has potentially surrounded the signal caller with his best supporting cast to date. Entering his second season with the team, he has now had a full off-season with offensive coordinator Pat Shurmur. Bradford always speaks highly of Shurmur. Even when he was traded to the Vikings, he spoke glowingly of him. "Me and Shurm have a great relationship," Bradford said. "We spent a lot of time together, and I think he knows me really well as a player and as a quarterback ... what I like and things we've done in the past. "I'm really excited to get to work with him and see him again." After a heartbreaking 10-9 home loss to the Seattle Seahawks in the 2015 Wildcard round of the playoffs, the team is aiming to get back to that point. Getting back to that situation seems to be the starting point for Bradford and deciding on his long-term future. The team must find a way to earn a playoff berth. Winning close games is another facet that Bradford must be able to do next season. He has developed a notorious reputation as a QB who seems to not be able to come through in clutch situations late in games. A prime example could be the teams Thanksgiving day game last season against the Detroit Lions. Bradford threw a late interception, helping the Lions seal a 16-13 victory. The teams last NFC North title came in 2015. A big reason why they were able to win the division is because of how good they were in (4-2 record) winning close games. With what seems to be an improved offensive line and running game on paper, these are few of many factors that can help the franchise win close games next season. According to spotrac.com, Bradford market value is right around $23.5 million dollars per-year. An extension obviously will not be cheap, as isn't for any starting QB around the league. The franchise has been lucky, as they haven't had to give a QB a long-term extension since Daunte Culpepper's 10-year, $102 million deal in 2003. Contracts have obviously changed a lot since then, but if Sam Bradford is able to have a winning season, help the franchise clinch a playoff berth, and thrive in clutch situations, he has a chance to be the teams answer under-center for the foreseeable future.